In Downloads from Heaven, Jay lays the Biblical foundation for his premise, and then follows up with story after story of personal encounters that illustrate the Biblical truth. People love stories! And Jay West’s personal stories are fun and funny – a great way for everyone to see the simplicity of the gifts of the Spirit. I love how Jay takes the “spookiness” out of walking in the Spirit that some Christians have been taught. This book clearly demonstrates the beautiful New Testament reality that every believer is a candidate to hear from and act upon a word straight from their Father’s heart to theirs. I believe Downloads from Heaven will be the launching pad for a new infusion of faith for believers to experience, and then release to others, a tangible, loving message from the Heavenly Father that brings life and changes lives for the glory of Christ! Does God still speak to His people? Do you want to know how, when and where? Then Downloads from Heaven is a book you want to read. Jay West documents Scripture in a masterful way and exposes strategies and tactics meant to keep us from understanding how God communicates with His people today. The systematic methodologies explained by Jay will make an indelible impression and lead people to a greater understanding of how the Lord still communicates to and through us. Jay’s style of writing and personal testimonies are down-to-earth, funny and real without being weird or scary. This book is for every believer and a must-read for those who want to learn to know God’s voice. 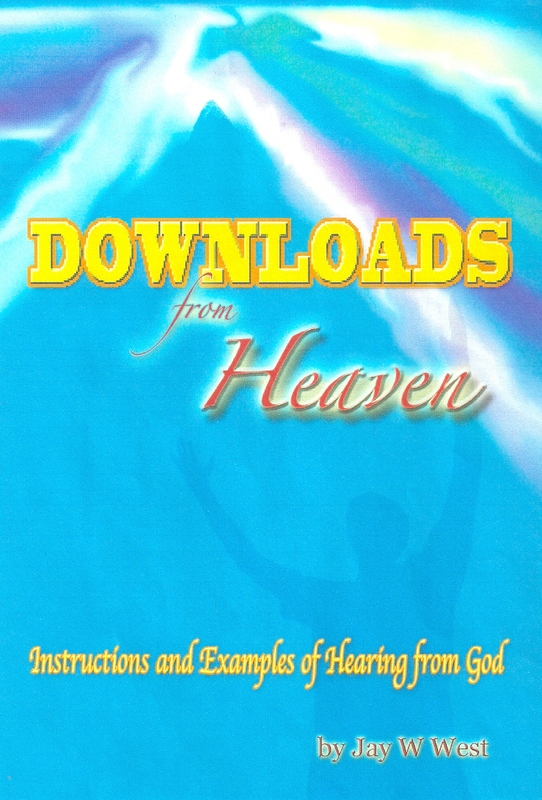 Downloads from Heaven is exciting and captivating yet simple and fun to read. It is easy to read yet it presents a foundational truth. This may sound like heresy, but I believe most Christians put too much emphasis on the written Word or Logos Word (the Bible) and far too little emphasis on the Rhema Word or Living Word (the Holy Spirit). This book shows how receiving downloads from heaven (Living Word) can cease from being occasional events and can become a process or a way of living with the Living Word. It is as simple as saying, “Yes Lord” to every slight nudge of the Holy Spirit. Jesus spent 3 years mentoring the disciples 24/7 and answering their questions, but He told His disciples it was good that He was leaving them because He would send them something better, which was not a book. He was going to send the Holy Spirit to His followers which meant they could get continuous Downloads from Heaven. When I met Jay 30 some years ago, he was already practicing getting downloads from heaven. So this is not just a theory but a way of life for Jay. He is showing you how it can be a way of life for you. I am in complete agreement with Jay that downloads from heaven needs to be a way of life for us. Jesus said the Holy Spirit would teach us all things. I personally have been practicing this as a way of life for more than 81 years. Jay begins the book with a dilemma. He hears an internal voice say, “Get off this plane! It is going to crash!” What should he do? Get off the plane and let the others die? Ignore the voice? What would you do? You need to read quite a ways to discover what Jay did. Downloads from Heaven is an inspiring and often entertaining account of what the Lord is doing through the ministry of Jay West. Humanities Dept. Grace University, Omaha, NE. If you are interested in purchasing one or more copies of my book, the suggested donation price is $15 per book. You may contact me at anointed2go@cox.net for further information on where to mail a check including extra for postage and handling. I am very honored that you have read this blog post and that you may be interested in my book. Thank you. Jesus is Lord. My son Jason has also just released a new worship CD titled, “Running Free” and if you are interested in learning more on how to secure this CD, you may contact me at anointed2go@cox.net. I have included a picture of the album cover below for you to review. This entry was posted in Everything Else, Kingdom Encounters, Kingdom Living, Ministry Update and tagged Downloads from Heaven, Eagle's Nest Worship Center, Grace University, Great Door Ministries, Jason West, Kristen Gray, Pastor Jim Hart, Words of Knowledge, worship album by anointed2go. Bookmark the permalink. Can’t wait to read your Book and hear Jason’s CD! Looks good Jay. Kindle version? Love all of the great, real testimonies of your book. I need to get it in my hands ASAP. was looking for a link to purchase the book?